The following books are standard works on monastic life and are available from the Monastery of the Holy Spirit bookstore located in the Abbey Store. 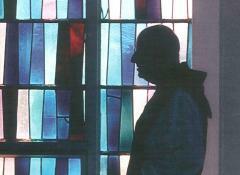 These are helpful tools for anyone discerning the monastic journey or exploring the lifestyle. Book Review by Amazon - Tears of an Innocent God invites the reader to explore the ways of the One who would have us perceive, listen, and love as Christ did, and still does: not by imitation, but through a gradual inner transformation. The book outlines two kinds of contemplation, the first involving activity on the part of the person seeking intimacy with God. Contemplation of the second kind is sudden, unexpected: a gift of God unmediated by the senses, intellect, memory, or imagination. The author speaks of the healing, transformative power of inner silence, and of the mysterious Round Dance of the Trinity. The author recalls his near death experience at ten, and the time when God suddenly appeared to protect him, minutes before he would have been murdered. Brother Elias relives his long sojourn on an island off the coast of Spain, where he meditated for many hours each day. After every chapter, he describes practices related to deep inner prayer, and to skillful ways of dealing with harmful thoughts and feelings. Brother Elias draws attention to the goal shared by all human beings: to become kindness incarnate, while living Christs paradigm of radical equality and inclusivity. He stresses the importance of becoming a whole person by integrating the inner with the outer sides of life. Tears of an Innocent God explores deeper levels of faith and ways to pray with gentle strength. OUR IMPRACTICAL LIFE by Fr Matthew Kelty of Gethsemani Abbey. What practical value have they, these Cistercian monasteries?